September found the Greeley presidential campaign to be a deeply dispirited enterprise of weirdly dissimilar factions, the leaders of which were hoping against hope to bring down the incumbent Republican war-hero in the White House, U.S. Grant. Nast's "Key-Note of the Campaign" is a virtuoso display of portrait caricature amidst a carnival of depression, alarm, frustration, anger, nausea, and mortification. 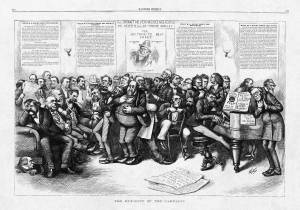 A central point in the cartoon is that the plans of the Liberal-Republican progenitor, Senator Carl Schurz (seated at the piano), have gone seriously awry. Schurz had been exceedingly surprised and disheartened by Greeley's nomination, but had stoically joined the campaign.